1. Begin by making the coconut ice: grease and line a 20cm square cake tin with baking parchment. Pour the condensed milk into a large bowl. Add the coconut and icing sugar and mix well until all the coconut is coated. Divide the mixture into two and colour one pink. 2. Spoon the white mixture into the tin and press down using a greased spatula until it covers the bottom in an even layer. Press the pink mixture over the top, spreading it right to the edges. Loosely cover and leave for a few hours (or overnight) to set and dry out. Use the baking paper to lift the coconut ice from the tin, then cut into squares. Store in an airtight tin in a cool place for up to 3 weeks. 3. When you are ready to ice the cake: roll the marzipan into a large enough circle that will cover the top and sides of the cake between 2 pieces of clingfilm. 4. Heat the jam in a small saucepan until liquid, then use a pastry brush to cover the outside of the cake with a thin layer of jam. 5. Peel the top layer of clingfilm off the marzipan, and then flip the sheet over the cake. Use your hands or a cake smoother to apply it over the top and sides of the cake, pressing firmly to make sure it sticks. When you are happy with the covering, remove the second layer of clingfilm. Allow the marzipan to dry completely before icing, ideally overnight. 6. Roll the fondant in the same way as the marzipan, then brush the cake with water and apply the fondant. Use a sharp knife to trim away the excess icing from around the bottom. 7. Finally make the peanut brittle; Line a baking tray with a sheet of baking parchment and set to one side. Scatter the peanuts over the tray. Pour the sugar into a saucepan, making sure it covers the bottom in one even layer. Heat on medium, swirling the pan gently to make sure all the sugar melts. Boil until the caramel is a dark golden brown colour, then remove from the heat and pour over the peanuts. Leave to harden for at least 20 minutes, then break into pieces. 8. 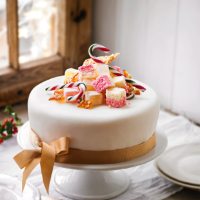 Tie a ribbon around the cake and decorate with a large pile of Christmas sweets, the coconut ice, nut praline and silver balls.